Seven years ago I spent Memorial Day weekend preparing for my bilateral mastectomy even though, of course, I had no idea how to do that. Who would? One thing I vividly recall about that weekend was going to the movie, Robin Hood, the one with Russell Crowe, and the whole time I sat there, I was able to concentrate for just minutes at a time before my mind would wander into the land of fear. I have no recollection about whether that movie was any good or not. Have you seen it? June 2nd was the date of my bilateral mastectomy. It’s one of those dates seared into my memory forever. I decided to share this unedited journal entry from a day or so prior to my surgery. It’s very personal, but I’m sharing it anyway because often patients get screwed up messaging suggesting if you just remain positive, display a brave persona and somehow keep on smiling, all will be fine. It’s not quite that simple. Or necessary. I am hoping someone who’s facing a mastectomy and feeling afraid might run across this post. I’m hoping you share about something you’ve been fearful of in the comments below, cancer related or not. After all, just knowing you’re not alone can sometimes do wonders to reduce your fear, right? Fear is normal when you’re facing scary things like cancer, surgeries or whatever it might be. To face your fears, first you have to admit you’re afraid. So, don’t be afraid to do that. Remember, be you. Be real. It’s enough. I am afraid of having a bilateral mastectomy. I am even afraid of the words. I am afraid of how I will look the first time I see my new reflection in the mirror. David (my husband) tries to reassure me, but I am still afraid. I am afraid the doctors will find more cancer in my lymph nodes. I am afraid of the pain which is sure to come. I am afraid of reading my pathology report. I am afraid of chemo, losing my hair and feeling sick. I am afraid of being treated differently by everyone around me. I am afraid I will cry (I did) when I get to the hospital for my surgery and they ask me how I am doing. I am afraid I will not be able to speak. I am afraid of drain tubes which David must empty. I am afraid of scars and having fake silicone-filled objects implanted in my chest that are to be replacements. I am afraid my breasts cannot be so easily replaced. I am afraid David might see me as less desirable, or worse, not desirable at all. Again, he tries to reassure me, but I am still afraid. I am afraid of being weak and wimpy. I am afraid of becoming a poor mother and a poor role model. I am afraid I’m already both. I am afraid of having a male surgical nurse. How dumb is that? I am afraid my cancer has spread already. 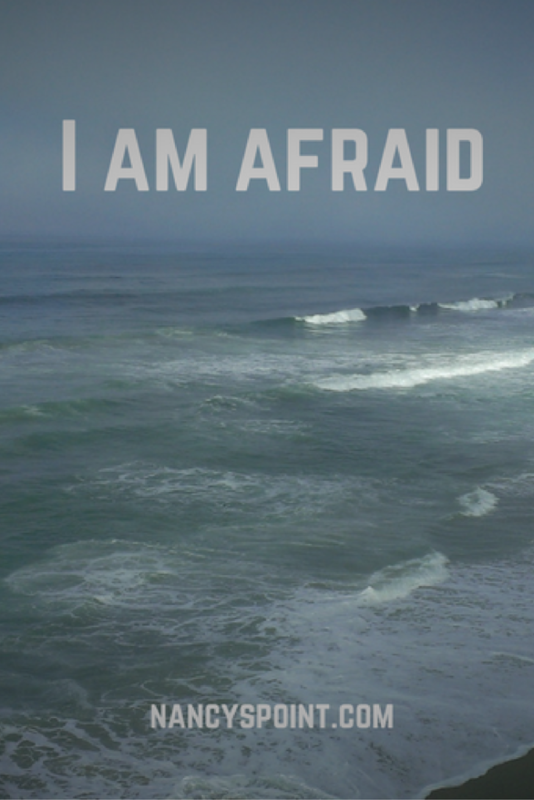 I am afraid of dying. I am afraid of a slow, miserable death like mother’s. I am afraid of moving forward into the unknown-ness of my future. I am afraid of moving too fast. I am afraid of standing still too long in the present because cancer’s tentacles are already attempting to take over my body cell by cell. I am afraid of moving too slowly. I am afraid to look back because all I see is mother lying in a bed covered with sheets that cannot disguise the cancer beneath. I am afraid of not moving at all. No matter where I look, there is fear and I am afraid. I must look forward to the future because along with the fear that is also where hope, happiness and life glimmer. Yes, that is where I choose to look. 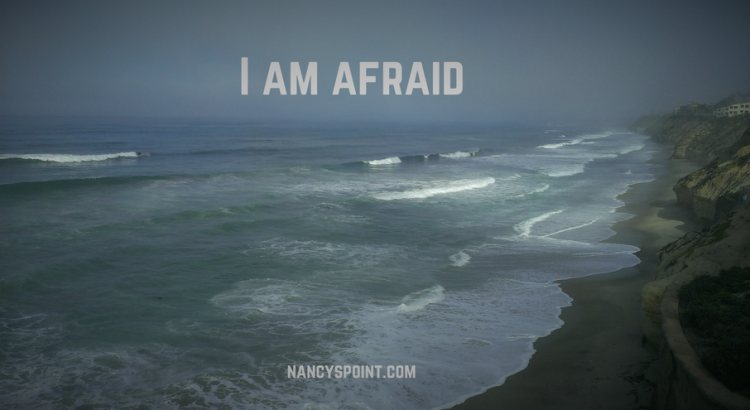 When have you been most afraid during your cancer experience? Cancer or no cancer, what are you afraid of today, if anything? 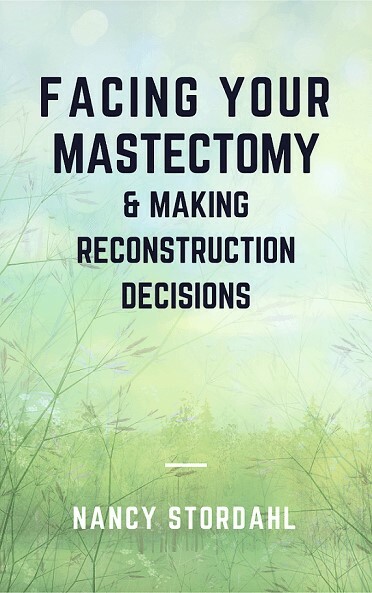 Have you had a mastectomy, lumpectomy or some other surgery before which you felt afraid? Sign up for weekly newsletters/updates from Nancy’s Point! Wondering what to expect? My ebook can help. My bilateral mastectomy is a week from now. Your post could have been written by me. I’m afraid of all of those things. I deflect with humor, but cry privately and with my husband at random times for random reasons. I need to be on the other side of this. The countdown is awful. Stephanie, Your fears are understandable and yes, the countdown is difficult. But remember, you can do this. We do what we must and you will too. Good luck next week and beyond. I hope you’ll keep us posted. I didn’t have a mastectomy, but I would have felt the same as you. I was petrified of chemo. Eileen, I was petrified of chemo too. So much fear comes along with cancer, as you know, of course. Thank you for sharing. I’ve been thinking about you and wondering how things are going. Every word you shared were like an echo of what’s been have running through my head. I’m more afraid of the surgery then I was of the chemotherapy. Ann, Your fears are perfectly normal. I hope you have someone you can confide openly with. I would also suggest journaling as a wonderful outlet. I wrote some things in mine I never shared with anyone and likely never will. My best to you. Thank you for the genuine way you have shared your personal fears here Nancy. May was my diagnosis month, but my mastectomies were months later. One of my greatest fears through those months was the fear of the unknown. So many unknowns. So many questions. And we just have to sit with those uncomfortable feelings at times. I believe that when I shared and discussed my fears with others, when I faced them on the pages of my journal like you did, that they lost some of their power. And yes, hope and life glimmer in close proximity to fear. Hope and life. That is what we get today. Thank you again Nancy for your words. They are helping many. Lisa, Cancer brings so many unknowns, that’s for sure. I love how you put it, “And we just have to sit with those uncomfortable feelings at times.” So true. And I agree, sharing and journaling and whatever else works, are great ways to take away some of that power and keep more for ourselves. Thank you for sharing, Lisa. I always love reading your insights. And thank you for your kind words, too. Thank you for sharing your feelings so honesty. This is a raw post, and the fear from your words is palpable. I totally get the fear. I had two lumpectomies (I had dirty margins with the first one) and chemo and radiation. I was petrified with each. Then five years later, Faun died and five months later, my oncologist tells me that the MRI revealed a mass in my breast. With her death fresh on my mind, this was so scary to me. I got yet another lumpectomy, showing the mass was benign (scar tissue). Believe it or not, I didn’t feel like celebrating. With dense breast tissue, I had my share of scares, and this was the final straw. I got a prophylactic bilateral mastectomy and fought hard for it. 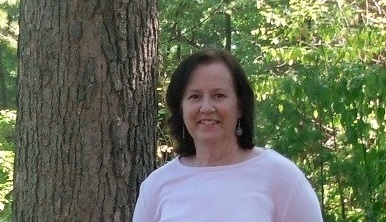 I knew I would get breast cancer again and it would be difficult to find, given my dense breast tissue. Oddly, I wasn’t afraid with the mastectomy because I was driven to fight doctors who belittled me for this choice. I was in fight mode, fighting the medical system, as you read in my book. But this surgery was crucial, as biopsy results showed my left breast (the one that didn’t have cancer) was filled with precancerous cells. The fear has since returned. The PTSD causes flashbacks, but I’m on a good regimen of medications that help me grapple with the fear. I do feel like I’m a weak person for having to need these medications, but they keep me from drowning in fear. Fear is such a huge factor. You wrote a brave post! Nancy, I just went through a bi-lateral mastectomy on June 28th. I’m 47 years old, married to a great guy and we have three amazing kids, ages 10, 12 and 14. I’m healing okay, but I can relate to every fear you mentioned above, and could probably add to your list. I’ve already done chemo and still have radiation to look forward to. That should start in August. I’m trying to get used to my new body. It’s a process! Thanks for your words. While many of us have fear in common, I’m comforted to know that I’m not alone in my feelings. Pam, It is a process indeed, and I don’t think it ever ends, not for me anyway. Wishing you all the best as you head into radiation. Thank you for sharing. You’re definitely not alone. I found out on February 19, 2014, that I had breast cancer. I was 38. Not a day goes by that I don’t think about cancer. Shannon, It’s been seven years for me and I still think about it. How could we not? Hope you’re doing okay. Thank you for sharing. Thank you Nancy for letting us peer into your very personal time before surgery. I’m new here and will see my specialist on Dec. 18 for the first time. I have been diagnosed with invasive ductal carcinoma. I have no idea what my treatment will be but I definitely have fear of being, like you said, wimpy and weak. I have had other major surgeries in the past (entire colon removed, total hysterectomy and investigative surgery). I have had many “parts” removed but that doesn’t mean you get used to it. Oddly enough, my biggest fear is chemo. If I could have a mastectomy without chemo I think that would be my best outcome. But we will see. I am 60 and I don’t know if I would want reconstructive surgery. I’m finding you Blog so helpful to prepare for the things to come. Maribeth, Well, I’m glad my post reached you and resonated. It’s normal to feel many emotions – among them fear. I will be thinking about you. We all do what we must and you will too. Good luck with everything. My best to you. Does National Cancer Survivors Day® Sound Too Celebratory?